Dreaming Of A White Christmas? These 25 Stunning Photos Of The Kenai Will Fill Your Heart With Joy! 1 – A picture perfect day gives way to the beautifully colored turquoise waters of the Kenai River at the Russian River confluence. 2 – Docked boats in Seward, Alaska look stunning against a snowy mountain backdrop. 3 – Riding the chair lift at Alyeska Resort up into the clouds and above the snowy mountain peaks. 4 – The upper Kenai River looks perfectly peaceful this time of year when all the anglers are hibernating for the winter. 5 – A musher takes his sled dog team across an open sea of snow on the Kenai Peninsula. 6 – Even rest stops on The Kenai, Alaska’s Playground get transformed into a winter wonderland paradise this time of year. 7 – Driving on the Seward Highway can be dangerous any time of year, but during the winter months the magical snowy views make the trip totally worth the while. 8 – As the Kenai River freezes and thaws with changing winter temps, the fascinating views get elevated to a whole new level. 9 – A single tree lit up with Christmas lights turns this whole area near Summit Lake into a peaceful holiday paradise. 10 – On that same note, it’s impossible to deny that a Summit Lake Lodge cabin getaway is a picturesque experience this time of year. WOW! 11 – Solitude amongst the clouds can be found on the Lost Lake Trail near Seward. 12 – Frost heaves, crisp temps and cloudy skies make for a fierce winter photo-op on The Kenai. 13 – A group of seals take a break from swimming by resting on floating ice chunks off the Homer Spit in Kachemak Bay. 14 – The view from Slaughter Ridge above Kenai Lake takes the rewards of winter hiking on The Kenai to a whole new level. 15 – The Alaska Railroad knows how to ring in the holiday season in style, there is no denying that. WOW! 16 – Spotting an alpenglow is always a treat, but it’s exceptionally special when it happens while driving through the pass. 17 – Catching air in a magical mountain town such as Cooper Landing is an extreme way to celebrate the cheerfulness of the holiday season. 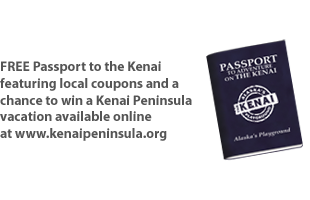 18 – Leave the big city of Anchorage and head towards The Kenai, Alaska’s Playground for a one way ticket to a winter wonderland paradise. 19 – The aerial views overlooking Resurrection Bay are like something straight out of a dream this time of year. 20 – So you think all the bears are hibernating? Think again! This guy is showing off his best snow dancing skills for one lucky photographer to enjoy. 21 – Alyeska Resort looks like it belongs right on the front of a post card. This place sure knows how to make the snowy months look good! 22 – When you think about winter on The Kenai, this is the exact image that should come to your mind each and every time. Peaceful, serene and breathtakingly beautiful. 23 – The soft and serene views overlooking a wintery Kelly Lake are enough to fill your heart full of love and happiness. 24 – Another one of the historic Alaska Railroad because we just can’t get enough of those brilliant blue and yellow Alaska colors against a snow mountainous backdrop. 25 – Sixmile River Valley looking south towards the charming little town of Hope is a snowy, wintery dream this time of year. Wishing all of our friends, fans and neighbors on The Kenai, Alaska’s Playground a safe and happy holiday season!